Avenel, a rural township in central northern Victoria, is 16 km north-east of Seymour. It is situated between the railway line to Wodonga and the Hume Freeway, with forested hilly country to the south, and attractive undulating country reaching northwards to the wheatlands. 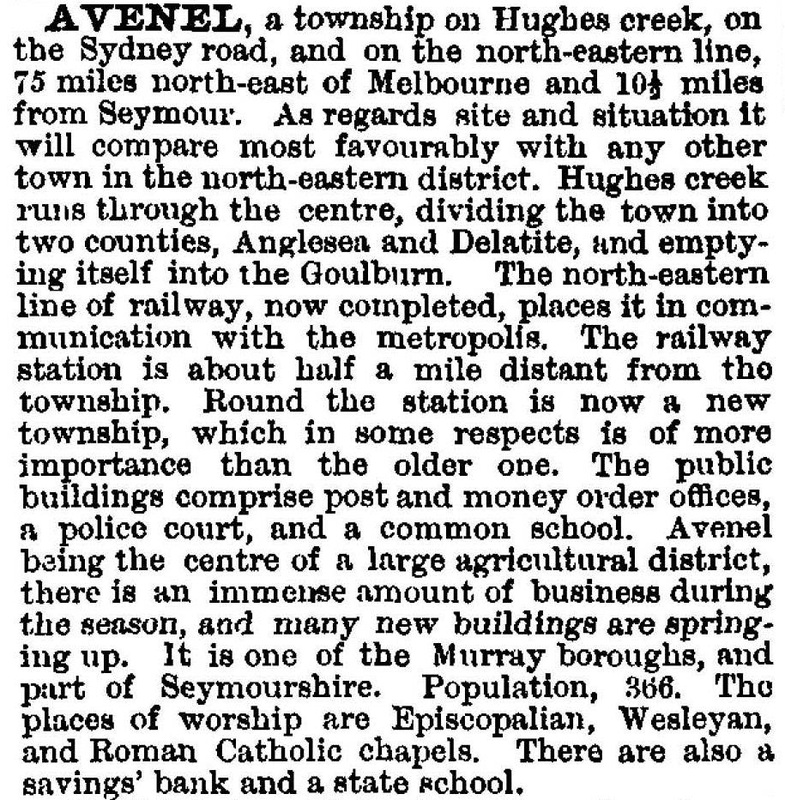 Avenel was a pastoral run on Hughes Creek, taken up in 1838 by Henry Kent Hughes. He named it after either his former property in England or the Village of Avenel, England. The township arose from there being a ford whereby Hughes Creek could be crossed by coaches and livestock. In 1859, after the ford had been replaced with a bridge, the government surveyor marked out the Avenel township. In the following year a hotel and a blacksmith were established. Several small farms were sold by the Crown, an early purchaser being John Kelly. His son Edward, attended the local school and later became known as Ned, the leader of the Kelly outlaw gang. The school was Anglican until being transferred to the National Board in 1858. During the 1880s friendly societies and sporting clubs were established. An Oddfellows hall from that period continues to be used. Avenel had originally been located on the road. The railway station, about 2 km northwards, caused a change in the township’s centre, and the growth of motor car transport since the 1920s caused a reversal to the first location. Avenel has a school (108 pupils, 2014), a golf course, an oval, tennis courts, a swimming pool, three churches and two halls. Although at risk of losing population to Seymour, its population has grown since the 1970s. There are three registered historic buildings: the former court house (1876), a coach house near the bridge over Hughes Creek and the bridge itself, built with local sandstone in 1859. 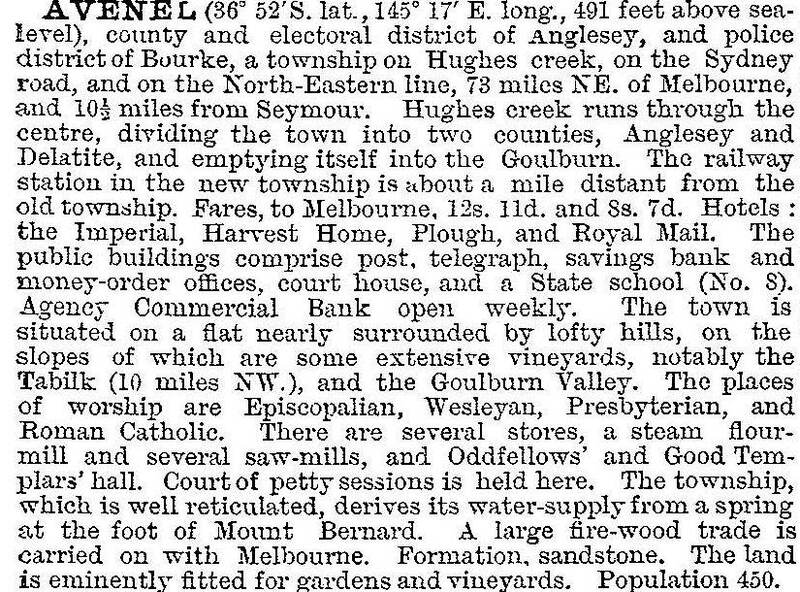 The Hume Freeway tourist route helps with patronage for a restaurant in the de-licensed Harvest Home Hotel and for Plunkett’s winery.